Luminous paint or luminescent paint is a glow in the dark paint used to mark fire exits, runways, or any area that needs to be illuminated in dark or dim conditions. Glow paint gives off light through phosphorescence or fluorescence and Rawlins Paints stocks luminous spray paint as well as regular finishes. We recommend that a white basecoat is used to improve the vibrancy of the glow in the dark spray, followed by a clear protective topcoat for improved durability. 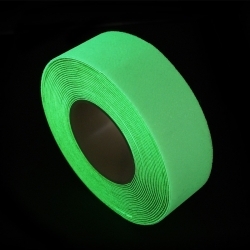 Glow In The Dark Hazard Striped Anti Slip Tape&nbsp;provides high visibility during the day&nbsp;and at&nbsp;night due to the photo-luminescent properties of the tape which store light energy and then release it in the form of a glow. 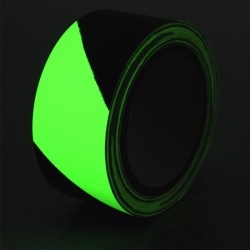 A professional grade of glow in the dark tape, offering up to 10 hours of glow time from a single charge. Manufactured to a professional standard, there is no limit to the amount of times Glow Tape can be re-charged, making it ideal for continuous use and permanent applications. Glow paints have multiple uses, from glow in the dark paint for walls to glow in the dark exterior paints, and can also be used for many different craft and decorative purposes. Rust-Oleum Glow in the Dark paint is particularly good for children’s projects, including painting toys and the walls of kids’ bedrooms. Exposure to light charges the paint so that when it becomes dark, or the object is placed in the dark, it will glow a green colour. Rust-Oleum glow paint is applied with a brush and is certified Toy Safe, making it ideal for children’s furniture, toys and more. It needs to be applied over a light coloured or white surface and can be applied to walls, ceilings, wood, metal and ceramic. 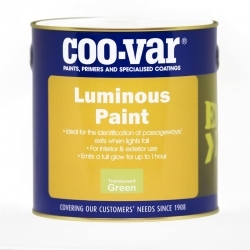 Coo-Var Luminous Paint also glows in the dark after it’s been exposed to light. It’s ideal to identify doors, fire exits, escape routes and any other important areas, either in the dark or should lights fail. It’s also good for theatrical effects and can be used on wood, metal and lots of other surfaces. It should be applied over Coo-Var Luminous Paint Foundation and will show up as a transparent finish under normal light. Coo-Var luminous foundation paint is essential for the luminous paint to work effectively, and makes it very durable. Lastly, Coo-Var Luminous Paint Clear Protective is a coating to use on top of the glow in the dark paint. This makes sure that the luminosity of the paint is protected against wear and tear and prolongs the colour retention. If you’re using glow in the dark exterior paint, it will also protect against the effects of weather. We stock a spray glow paint by Rust-Oleum. It works in the same way as the brush-on luminous paints and also appears off white in a normal light. Rust-Oleum Glow in the Dark spray paint can be sprayed onto ceilings, walls, and any other objects to make them glow in the dark after exposure to light. Glow spray paint can be applied to wood, metal, plastic and many more surfaces and can be easily cleaned with soap and water. As it’s fast drying and can be touch dry within as little as 15 minutes. It should also be applied over a light or white surface and is perfect for school projects, bedrooms and decorations and as floor spray paint. Used to mark out pedestrian foot traffic areas that don’t have great lighting, to make areas more visible and accessible. It can also be used in workplaces, factories, schools, warehouses, national arenas, shopping centres – anywhere, in fact, that needs to be marked clearly. Glow in the Dark Hazard Striped Anti Slip tape gives high levels of visibility during the day and during the night, thanks to its photo-luminescent properties. Working in a similar way to luminous paint, the hazard tape stores light energy and releases it in a glow during dark conditions. It makes areas that are difficult to see clearly much safer for people to walk through, or to find in dim or poorly lit conditions. Glow tape can be safely and easily applied to wood, concrete or metal and is a super speedy way to make an area safer. The glow tape can be recharged an infinite number of times so it’s great for continuous use and doesn’t need to be replaced very often.